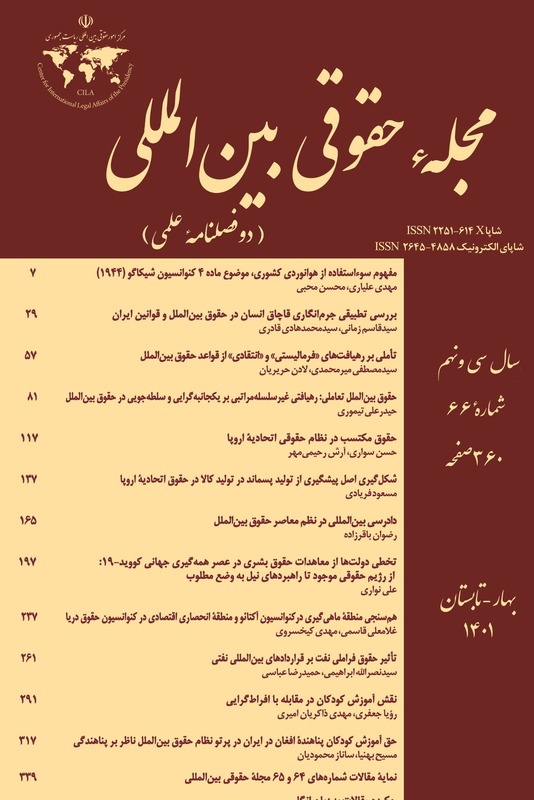 دیوان بین‌المللی دادگستری، در راستای اعمال حقوق، با تفسیر قواعد و مقررات موجود در جامعه بین‌المللی، به توسعه حقوق بین‌الملل که دربردارنده مفهوم تغییر و نوآوری است، کمک شایانی نموده ‌است. وظیفه اصلی دیوان بین‌المللی دادگستری، حل‌و‌فصل اختلافات میان دولت‌هاست. دیوان در این راستا در برخی از آرای خود با استفاده از تفسیر پویا در مسیر تطابق قصد طرفین معاهده با مقتضیات زمان و نیازهای جامعه بین‌المللی و با کشف اراده واقعی طرفین، ابهامات موجود در حقوق بین‌الملل را رفع کرده است. نوشتار حاضر با برقرارکردن ارتباط میان دیوان بین‌المللی دادگستری که نمی‌تواند صریحاً قاعده‌سازی کند، با تفسیر پویا که برخی آن را قاعده­ساز می­دانند، نقش تفسیر پویا را در زدودن ابهامات موجود و پر‌کردن خلأها در حقوق بین‌الملل، فارغ از دیگر ابزارهای مؤثر در این خصوص، تحلیل کند. The International Court of Justice, by way of applying the law through the interpretation of the rules and regulations of the international community, has played a significant role in developing International Law that entails the concept of change and innovation. The main function of the Court is to settle legal disputes submitted to it by States. In this regard, the Court in some of its Judgments has resolved ambiguities in international law by applying dynamic interpretation to correspond the true intention of the parties and finally discovering their true intention with considering circumstances and requirements of the international community. By making a relationship between the International Court of Justice which is unable to make rules expressly, and the dynamic interpretation, that some believe it can make a rule, this paper tries to analyze how dynamic interpretation besides other effective mediums in this regard can determine and make clear the existing ambiguities and fill the gaps in International Law. انصاری، باقر؛ نقش قاضی در تحول نظام حقوقی، میزان، ۱۳۸۷. جعفری‌تبار، حسن؛ فلسفه تفسیری حقوق، شرکت سهامی انتشار، ۱۳۸۸. زرنشان، شهرام؛ شکل‌گیری و شناسایی حقوق بین‌الملل عرفی، گنج دانش، ۱۳۹۲. سادات‌میدانی، حسین؛ صلاحیت قانونگذاری شورای امنیت، چاپ دوم، دفتر مطالعات سیاسی و بین‌المللی، ۱۳۸۷. شاملو، سوده؛ نسبیت احکام دیوان بین‌المللی دادگستری، شهر دانش، ۱۳۹۳. ضیائی بیگدلی، محمد رضا؛ حقوق معاهدات بین‌المللی، چاپ چهارم، گنج دانش، 1388. فلسفی، هدایت‌الله؛ حقوق بین‌الملل معاهدات، چاپ سوم، فرهنگ نشر نو، ۱۳۹۱. حبیبی، همایون و سوده شاملو؛ «نقش دیوان بین‌المللی دادگستری در توسعه حقوق بین‌الملل»، فصلنامه ‌پژوهشحقوقعمومی، سال ۱۵، شماره ۴۱، زمستان ۱۳۹۲. رسول‌پور، امیر ارسلان و عبدالله عابدینی؛ «حرکت به سوی قاعده‌سازی و انگاره‌های معاصر: رویه‌قضایی در آینه دیوان بین‌المللی دادگستری»، مجله پژوهش‌های حقوقی، شماره ۲۱، نیمسال اول ۱۳۹۱. سواری، حسن و محمد صالح عطار؛ «گونه‌شناسی رژیم حقوقی تعهدات بین‌المللی»، فصلنامه پژوهش حقوق عمومی، شماره ۴۴، پاییز ۱۳۹۳. سیفی، جمال؛ «تفسیر معاهده در زمان و قاعده حقوق میان­دوره‌ای»، چاپ‌شده در: جامعه بین‌المللی و حقوق بین‌الملل در قرن ۲۱؛ مجموعه مقالات اهدایی به استاد محمد رضا ضیائی‌ بیگدلی، شهر دانش، ۱۳۹۲. فلسفی، هدایت‌الله؛ «ماجرای تفسیر در دیوان بین‌المللی دادگستری»، چاپ‌شده در نقش دیوان بین‌المللی دادگستری در تداوم و توسعه حقوق بین‌الملل، انجمن ایرانی مطالعات سازمان ملل متحد، ۱۳۸۹. محبی، محسن و وحید رضادوست؛ «تفسیر تکاملی معاهدات در حقوق بین‌الملل در پرتو قضیه اختلاف در خصوص کشتی‌رانی و حقوق مربوط به آن (کاستاریکا علیه نیکاراگوئه)»، مجله حقوقی بین‌المللی، شماره ۵۳، پاییز و زمستان ۱۳۹۴. حبیبی مجنده، محمد؛ رویه دیوان بین‌المللی دادگستری در تفسیر معاهدات، پایان‌نامه کارشناسی ارشد حقوق بین‌الملل، دانشگاه علامه طباطبایی، ۱۳۷۷-۱۳۷۶. رسول‌پور، امیر ارسلان؛ قدرت قاعده‌سازی تصمیمات قضایی دیوان بین‌المللی دادگستری‌، پایان‌‌نامه کارشناسی ارشد حقوق بین‌الملل، دانشگاه علامه طباطبایی، 1389. کامیار راد، ساناز؛ قاعده‌سازی در دیوان بین‌المللی دادگستری از مجرای تفسیر، پایان‌نامه کارشناسی ارشد حقوق بین‌الملل، دانشگاه مفید، تابستان ۱۳۹۴. Aharon, Barak, Purposive Interpretation, Princeton University Press, New Jersey, 2005. Beaulac, Stephane, The Power of Language in the Making of International Law, Martinus Nijhoff Publishers, Boston, 2004. Bedi, Shiv, The Development of Human Rights Law by the Judges of the International Court of Justice, Hart Publishing, North America, 2007. Bjorge, Eirik, The Evolutionary Interpretation of Treaties, Oxford University Press, United Kingdom,1st Ed., 2014. Crawford, James, Brownlie’s Principles of Public International Law, Oxford University Press, 8th Ed., 2012. Danilenko, Gennadiĭ Mikhaĭlovich, Law Making in International Communities, Martinus Nijhoff Publishers, London, 1993. Dorr, Oliver, Schmalenbach, Kirsten, Vienna Convention on the Law of Treaties: A Commentary, Springer, Berlin Heidelberg, 2012. Lauterpacht, Hersch, The Development of International Law by International Court, Cambridge University Press, London, 1982. Linderfalk, Ulf, On the Interpretation of Treaties: The Modern International Law as Expressed in the 1969 Vienna Convention on the Law of Treaties, Springer, Netherlands, 2007. McNair, Arnold Duncan, The Law of Treaties, Oxford University Press, 1986. Orakhelashvili, Alexander, The Interpretation of Acts and Rules in Public International Law, Oxford University Press, New York, 2008. Shahabuddeen, Mohamed,Precedent in the World Court, Cambridge, Cambridge University Press, Cambridge, 1996. Shaw, Malcolm, International Law, Cambridge University Press, 6th Ed., 2008. Venzke, Ingo, How Interpretation Makes International Law; On Semantic Change and Normative Twists, Oxford University Press, 1st Ed., United Kingdom, 2012. Wolfrum, Rüdiger & Rüdiger, Volker, Developments of International Law in Treaty Making, Springer, 2005. Abi-Saab, Georges, “Fragmentation or Unification: Some Concluding Remarks”, International Law and Politics, vol. 31, 1999. Arato, Julian, “Accounting for Difference in Treaty Interpretation Over Time”, in Bianchi, Andrea, Peat, Daniel, Winsdor, Matthew (eds. ), Interpretation in International Law, Oxford University Press, United Kingdom, 1st Ed., 2015. Bjorge, Eirik, “The Vienna Rules, Evolutionary Interpretation and the Intentions of the Parties”, in Bianchi, Andrea, Peat, Daniel, Winsdor, Matthew (eds. ), Interpretation in International Law, Oxford University Press, United Kingdom, 1st Ed., 2015. Brunnée, Jutta, “International Legislation”, in Wolfrum, Rüdiger(ed), Max Planck Encyclopedia of Public International Law, Oxford University Press, 2010. Dawidowicz, Martin, “The Effect of the Passage of Time on the Interpretation of Treaties: Some Reflections on Costa Rica v. Nicaragua”, Leiden Journal of International Law, vol. 24, 2011. Dupuy, Pierre-Marie, “Evolutionary Interpretation of Treaties: Between Memory and Prophecy”, in Enzo Cannizzaro (ed),The Law of Treaties Beyond the Vienna Convention, Oxford University Press, New York, 2011. Helmersen, Sondre Torp, “Evolutive Treaty Interpretation: Legality, Semantics and Distinctions”, European Journal of Legal Studies, vol. 6, Issue, Spring/Summer 2013. Herdegen, Matthias, “Interpretation in International Law”, Max Planck Foundation for International Peace and the Rule of Law under the Direction of Rüdiger Wolfrum, 2013. J. Aznar Gomez, Mariano, “The 1996 Nuclear Weapon Advisory Opinion and Non Liquet in International Law”, International and Comparative Law Quarterly, vol. 48, part. 1, 1999. Medina, Cecilia, “The Role of International Tribunals: Law-Making or Creative Interpretation?”, in Dinah Shelton(ed), The Oxford Handbook of International Human Rights Law, Oxford University Press, 1st Ed., 2013. Neff, Stephan C., “In Search of Clarity: Non Liquet and International Law”, in Kaiyan Homi Kaikobad and Michael Bohlander (eds), International Law and Power Perspectives on Legal Order and Justice, Essays in Honour of Colin Warbrick, Martinus Nijhoff Publishers, 2009. Neuhold, Hanspeter, “The Inadequacy of Law-making by International Treaties: Soft Law as an Alternative?” in Rüdiger Wolfrum, Volker Röben (eds. ), Developments of International Law in Treaty Making, Springer, 2005. Oellers-Frahm, Karin, “The Evolving Role of Treaties in International Law”, in Russell A. Miller & Rebecca M. Bratspies (eds. ), Progress in International Law, Martinus Nijhoff Publishers, Brill, 2008. Osamu, Inagaki, “Evolutionary Interpretation of Treaties Re-examined: The Two-Stage Reasoning”, Journal of International Cooperation Studies, vol. 22, No. 2.3, 2015. Petersen, Niels, “Lawmaking by the International Court of Justice—Factors of Success,” in Russell A. Miller; Peer C. Zumbansen (eds), Beyond Dispute: International Judicial Institutions as Lawmakers, German Law Journal, vol. 12, No. 05, 2011. Tams, Christian J., “The World Court’s Role in the International Law-Making Process”, University of Glasgow, School of Law, March 8, 2014, pp. 1-21. Van der Vlies, I.C., “Legislation in a Global Perspective”, in Julia Arnscheidt, Benjamin van Rooij, Jan Michiel Otto (eds. ), Lawmaking for Development, Leiden University Press, 2008. Venzke, Ingo, “The Role of International Courts as Interpreters and Developers of the Law: Working Out the Jurisgenerative Practice of Interpretation”, Loyola of Los Angeles International and Comparative Law Review 99, 2011. Report of the International Law Commission, 57th session, 2 May-3 June and 11 July-5 August 2005, Supplement No. 10 (A/60/10). Report of the International Law Commission, 55th session, 2013, Supplement No. 10 (A/68/10). Aegean Sea Continental Shelf Case, (Greece/ Turkey), Judgment of 19th December 1978, ICJ Reports, 1978. Case Concerning Pulp Mills on the River Uruguay (Argentina v. Uruguay), Judgment of 20 April 2010, ICJ Reports, 2010. Case Concerning Rights of Nationals of the United States of America in Morocco, Judgment of August 27th, 1952, ICJ Reports, 1952. Competence of the General Assembly for the Admission of a State to the UnitedNations, Advisory Opinion of 3 March 1950, ICJ Reports, 1950. Dispute Regarding Navigational and Related Rights,(Costa Rica/Nicaragua), Judgment of 13 July 2009, ICJ Reports, 2009. Legal Consequences for States of the Continued Presence of South Africa in Namibia Notwithstanding Security Council Resolution 276, Advisory Opinion of 21 June 1971, I.C.J Reports, 1971. Reparation for Injuries Suffered in the Service of the United Nations, Advisory Opinion 11 April 1949, ICJ Reports, 1949. Dissenting Opinion of Judge Tanaka, South West Africa (Liberia/ South Africa), Second Phase, ICJ Reports, 1966. Dissenting Opinion of M. Alvarez, Reservations to the Convention on the Prevention and Punishment of the Crime of Genocide, Advisory Opinion of 1951, ICJ Reports, 1951. Separate Opinion of Judge Alvarez, Reparation for Injuries Suffered in the Service of the United Nations, Advisory Opinion of 1949, ICJ Reports, 1949.